April 3, 2019 After tonnes of leaks, the Borderlands 3 launch has been confirmed for September 13. Gearbox has just confirmed that Borderlands 3 will release later this year. An announcement earlier today confirmed information from several leaks, revealing that the next trip to Pandora will begin on September 13. That news comes from a new trailer, which you can check out below. As well as confirming the names and some of the abilities of the Borderlands 3 vault hunters, the trailer shows the release date, as well as confirming that the game will be exclusive to the Epic Games store for a period of roughly six months, releasing on other storefronts in April 2020. Gearbox CEO Randy Pitchford confirmed last week that we’d be getting the official release date today. A tweet that appeared to go live ahead of schedule pointed to September 13, as did an advert that was served to some YouTube viewers earlier this week, but this is the first official confirmation of both the release date and the Epic exclusivity we’ve had so far. 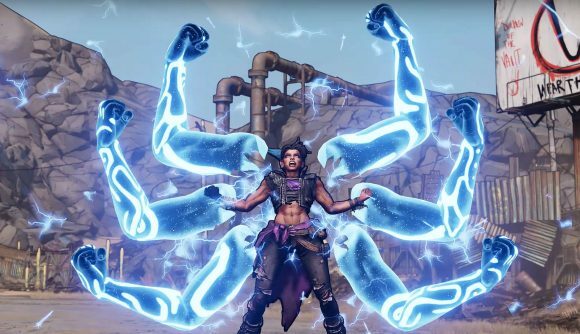 There’ll be even more information about Borderlands 3 in a gameplay reveal event on May 1, so we won’t have to wait too long to find out more. All this means it’s not too long until the Borderlands 3 release date. We’ll be waiting a little over five months for our next trip to Pandora, but given that we’ve been waiting this long since Borderlands 2 released, I’m sure we can manage just a little longer. The Epic exclusivity is likely to prove as unpopular as ever, but it’s interesting to see that the timed window is shorter than in the cases of games like The Division 2 or Metro Exodus. Those games won’t be available elsewhere on PC until a full year after launch, but Borderlands’ Epic window will be limited to just half that time, suggesting that Epic are starting to loosen its hold just a little.